But even with these marketable green credentials, this piece has brought on a storm of angry comments, making up about half of the total 159. An idea which is pretty much fundamental to what Adbsuters do. Yet even his mild suggestion that advertising, or commercial propaganda, should somehow be restrained (and no small amount of confusion among the readers as to which arguments were White’s and which he was taking issue with), was enough to prompt outcry from a large portion of those who feel the need to comment. That’s pretty depressing really. Perhaps White should have began with advertising directed at children, that angle at least should arouse less controversy. 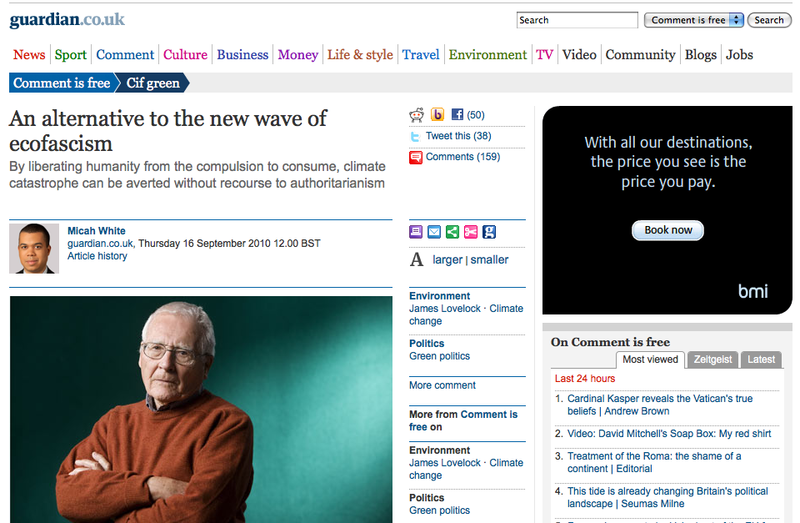 Of course this article about reducing consumption was finely balanced with an ad for BMI airlines just to right. For a history of advertising the best place to start is Adam Curtis’ The Century of Self and his blog here. There is also a ‘rare interview’ with him here.